Here is an anecdote of 2007 vintage. A well researched book on the history of Gujarat’s maritime trade with central Asia was being released. The small audience in the hall was largely made up of academics and some business leaders behind the trust that funded the research. Thus, the chief guest could put pressures of politics aside and speak from heart. “We, BJP and Congress, will keep fighting on political lines,” said Narendra Modi, “but on what values this politics should be fought? People like [naming an academic-journalist-activist in the audience] should guide all of us about those values.” That was his way of greeting a fellow anti-emergency activist who has been among his leading critics in Gujarat. Yes, so what should be those values – supposing they can be separate from political lines? 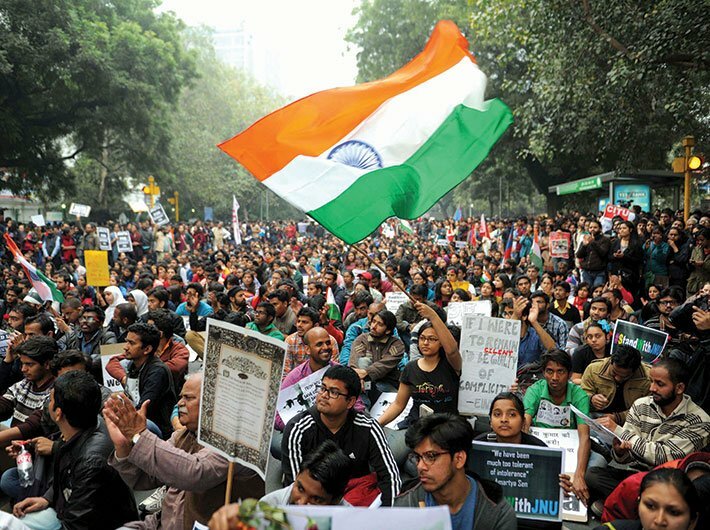 In the light of the recent events at JNU, how about nationalism as one such a value? If a citizen cares for all the rest of fellow citizens, where is any harm in it? It is a great bonding, and can only do good to all. In the process, if a citizen feels a surge of emotion at a soldier’s martyrdom, that is a welcome sense of gratitude, of camaraderie. This patriotic sense, this nationalism, this bonding, of course, should not be limited to soldiers, and it will extend to all fellow citizens. Thus, this citizen will introspect if she also feels a surge of emotion when she hears of a farmer ending his life. Or, when she hears of anger a Meghalaya woman feels for the government’s attempts to grab her land for uranium mining. Or, when a man – his religion does not matter to the great mother that is India – is lynched by a mob for no proof but mere rumours of his food preferences. Or, when ruling party leaders routinely express desire to send somebody off to a neighbouring country. That is the trouble with nationalism, patriotism, and similar noble notions. Rabindranath Tagore, the most important public intellectual of twentieth century India, only saw “selfishness” in it. George Orwell went further, and wrote, “Nationalism is power-hunger tempered by self-deception.” When the abstract ideals turn concrete, they mean whatever the one with power wants it to mean. That can hold equally true for political slogans of all varieties: left, right, bahujan and what not. Since it is the Hindu right-wing that has won the power to rule, they are the ones translating noble slogans into not-so-noble reality for us. That is why every innocuous-seeming slogan and symbol is a tool for drawing a line, between the us and the others. Cow, Vande Mataram, some or the other temple, Gita, yoga, Bharat Mata: they all – arguably – have an element of the sacred. But in each case, they serve only one purpose: to alienate one community. When the right wing reduces a religious element to a political tool to consolidate to its vote bank, who is denigrating the sacred? It was this instrumental use of religion as well as of Bharat Mata that ignited passions over the JNU affair. If there is no enemy, every right wing (as the recently deceased intellectual Umberto Eco showed us) invents enemies – since hate is the only binding factor for its support group. That enemy was invented in a TV studio. (As for anti-India slogans, there is no proof the students put behind the bars shouted them, and they have condemned the same too.) We have heard of manufacturing consent, but this government seems to be manufacturing dissent too. A third of the term later, the government has not only conclusively failed to deliver on any of the promises made but there are no signs of doing it in the remaining period. So, the proverbial last refuge has become the first and hate politics is replacing governance.